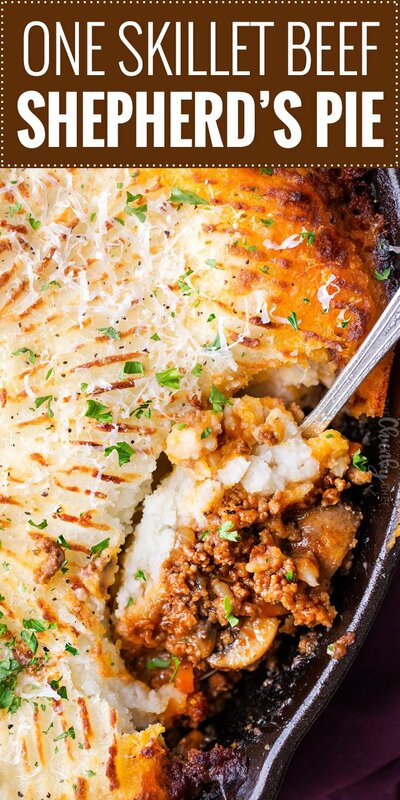 Rich and flavorful beef shepherd’s pie recipe, made easy in one skillet! Ground beef, tender vegetables, and fluffy mashed potatoes… what could be better! 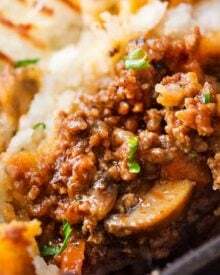 Classic comfort food, made with readily available ground beef, sautéed mushrooms and vegetables, and a rich savory gravy sauce, all topped with fluffy mashed potatoes. No oven safe skillet? No worries, I’ve got that covered! It’s officially comfort food season… complete with chilis, casseroles, stews/soups, and great one pot/skillet meals! 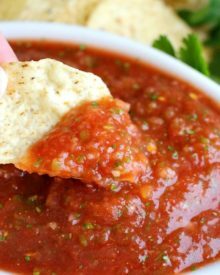 This is absolutely my favorite food season, since the flavors are just fantastic, and all the food makes you want to go curl up on the couch with a blanket and a big bowl or plate. Here in the Chunky Chef household, we love our one pot meals. 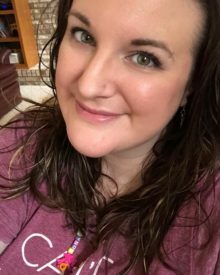 I even have a whole section of them here on the blog, have you checked them out? There’s something really awesome about a meal that tastes amazing, and there’s not a TON of dishes to wash afterwards. Some of you may be questioning the name here… after all, a shepherd’s pie is not traditionally made with ground beef, but rather made of ground lamb or mutton. My family is not a fan of the taste of lamb/mutton, so I always make ours with ground beef. Plus, here in the Midwest, ground beef is much more readily available. I almost named it Cottage Pie, which is what a Shepherd’s Pie made with beef is usually called… but here’s why I didn’t. 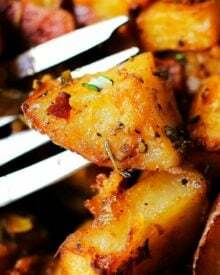 For this recipe, I usually use leftover mashed potatoes, but in the recipe notes section (directly following the recipe below) I’ve detailed other potato options, as everyone has their favorites. Let’s talk about this fantastic filling! I kept my filling to onion, carrots and mushrooms, but below are some options for some other add-ins. 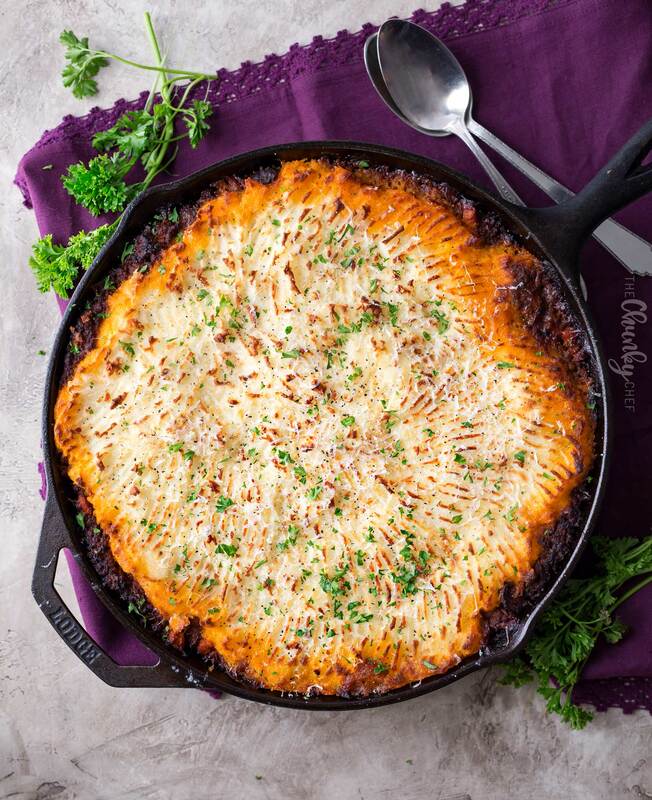 The next time you’re craving something ultra comforting, I hope you give this One Skillet Beef Shepherd’s Pie Recipe a try!! 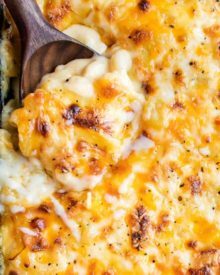 Looking for other comfort food classics? Cast Iron Skillet – the most used pan in my kitchen… I love the sear it gives! 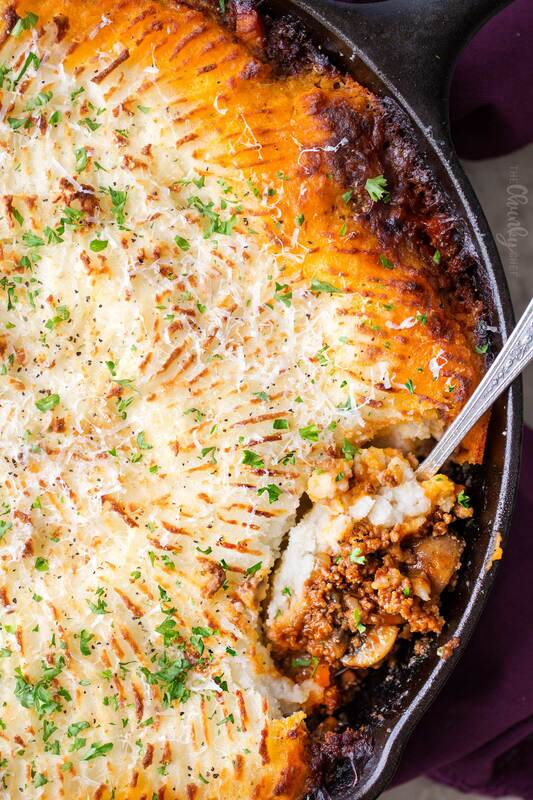 WANT TO TRY THIS SHEPHERD’S PIE RECIPE? 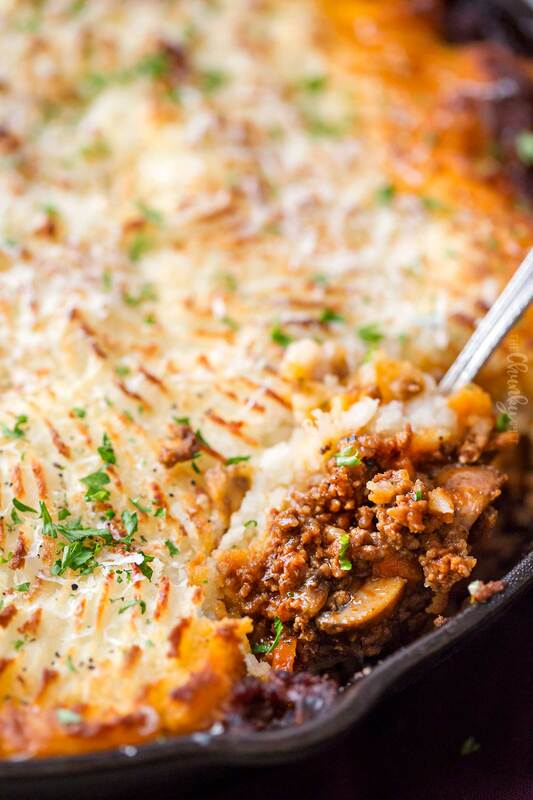 Rich and flavorful beef shepherd's pie recipe, made easy in one skillet! Ground beef, tender vegetables, and fluffy mashed potatoes... what could be better! Preheat oven to 375 F degrees. Heat a BIG oven safe skillet over MED heat. Add oil and butter and melt. Once melted, add onion, carrots, mushrooms, garlic, dried oregano, and 1/2 the salt. Cook, stirring occasionally, about 8-10 minutes. Add in tomato paste, stirring to combine, and cook 5-7 minutes, until tomato paste is a dark, brick red color (this really brings out the tomato flavor). Add ground beef and cook about 4 minutes, or until cooked through, breaking it up into small crumbles as it cooks. If needed, drain excess grease and return beef to skillet (some types of beef won't need this done, so use your judgement). Stir in beef stock, Worcestershire sauce remaining salt, and black pepper. Simmer for a few minutes, until mixture is slightly thickened. Top with mashed potatoes (see recipe notes section), and Parmesan cheese. Use a fork to rough up the top of the potatoes, then dot with the butter pieces. Bake 40-45 minutes, until bubbly and potatoes are browned. Let cool 5-10 minutes before serving. Sprinkle with minced fresh parsley and enjoy! Use leftover mashed potatoes (these horseradish mashed potatoes work perfectly!). Use your slow cooker to make the mashed potatoes (like this version). 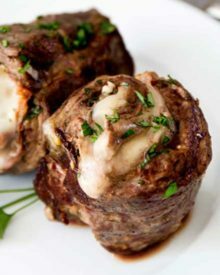 Use pre-made or instant potatoes - not the best option, but works in a pinch. Boil potatoes 15 minutes, or until fork tender, then drain. Return to hot pot, add butter and mash. Add milk and cheese, stirring/mashing to combine. Season to taste. *** If you don't have an oven safe skillet, complete recipe through step 4, then transfer to a greased 3 qt baking dish, then continue with recipe, starting at step 5. Hello! I was wondering… I don’t have a large enough skillet and the small one I do have, I’m not sure it’s oven safe. Would a casserole dish suffice? I have a large one of those. Thanks! Yes that would work just fine 🙂 Just cook through step 4 in a skillet, then transfer it to a casserole dish and proceed with step 5. Amazing recipe, rich and flavorful, only addition to the recipe were peas. Anxious to try this recipe. Does this need a thickener of flour or cornstarch? Hi Mary Ann 🙂 I’ve never needed one, it reduces down on it’s own. If you find it’s not doing that on your stove, then adding a bit of cornstarch whisked in with a splash of water will certainly help it. 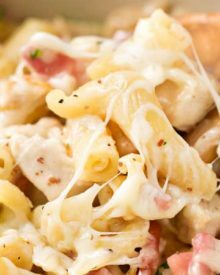 What a great comfort food dish! I want a big bowl now! One pot meals are the best! My family will love this one! This looks amazing! Coincidentally, my husband made shepherd’s pie for dinner last night! I love your one-skillet idea, and will pass this along for next time. it’s the season for dishes like this, after all! 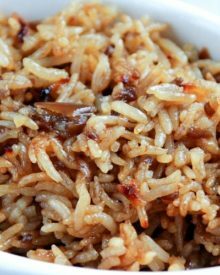 This is a great one pot meal! I will have to make it soon! Hooray for comfort food season! This is definitely a must-make! MUST. TRY. I’ve been wanting to go a good ol’ Shepherd’s pie for a while now, and this one looks like perfection. This recipe will be a big winner with my family! Looks delish! I seriously love all of your recipes! 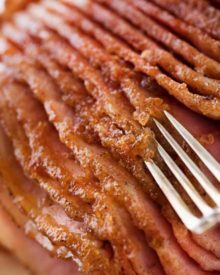 I’ll be making this for my family this week! This is the perfect way to use up leftover mashed potatoes!